Hua Hin, Thailand: Dreams of creating a huge economic bloc covering half the world’s population are slowly becoming a reality in a plan that would boost Asia’s global clout, analysts and officials say. 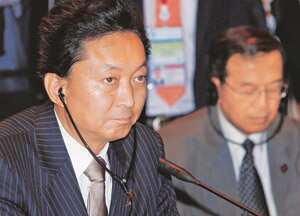 Japanese Prime Minister Yukio Hatoyama aired his proposal for a so-called East Asian Community to fellow leaders at a summit in Thailand this weekend, saying that the region should aspire to “lead the world". “It is coming together," former Association of Southeast Asian Nations (Asean) secretary general Rodolfo Severino said. A more cohesive Asia would have a bigger role in global affairs, Severino said, especially after the region rode out the global economic crisis more quickly than the West. “It’s not just Asia coming together economically, but politically as well. The more integrated you are, the more forceful you are," said Severino, who heads the Singapore-based Asean Studies Centre. The foundations of any East Asian community would lie in the web of free trade pacts that the 10-member Asean has signed with China, Japan, South Korea, India, Australia and New Zealand. At the Thailand summit, regional leaders agreed to carry out a feasibility study on a huge free-trade zone covering Asean, China, Japan and South Korea, Thai foreign minister Kasit Piromya said. A separate study on a wider grouping that would also take in India, Australia and New Zealand will be carried out in tandem, and Kasit said the two could be combined to create “one regional cooperation on a larger scale". East Asia has also this year agreed on a $120 billion (around Rs5.6 trillion) fund—using its currency reserves—to help nations in financial distress without the need to borrow from the International Monetary Fund. Asian countries additionally made a concerted and coordinated effort to provide stimulus packages during the recent economic crisis which helped the region’s relatively quick rebound. But any East Asian community remains a long way off, largely due to the lack of concrete proposals and disagreements about the involvement of the US and the influence of China. Japan and some other countries want to give Washington a role in the group, as a counterbalance to the influence China might have on a new regional architecture. China’s growing wealth has made it a major player in meetings with Asean in particular. Hatoyama however said that Japan’s alliance with the US remained the “cornerstone" of Tokyo’s foreign policy. But Bridget Welsh, a South-East Asia expert with the Singapore Management University, said she thought the US-China contest was overblown. “Relations between China and the US remain strong and there are common interests towards South-East Asia in many areas such as stability and economic growth," Welsh said. “The points of conflict are not pressing." Merging up to 16 countries into a free trade zone is fraught with challenges, especially in the sensitive area of agriculture, said Severino, noting that Australia, India, Japan and South Korea are major farm producers. Freeing up the services sector, such as negotiating open skies accords for the aviation sector, is another challenge, he said. Thai Prime Minister Abhisit Vejjajiva said the issue is “more about the modalities and the steps" by which economic integration can be achieved.